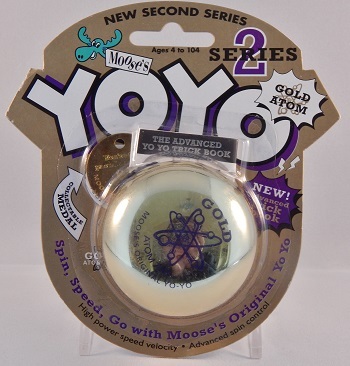 From Moose's Series 2 line, a gold plated, tournament shaped yo-yo with metal axle and starburst response. This yo-yo was Moose's top-of-the-line model, although there was no difference in price or play performance between this model and its very close cousin, the Silver Bullet 6000. Came with an advanced yo-yo trick sheet and one gold collectible medallion.